A customer asked us to design an outfit for little boys to coordinate with our Minnie Mouse pumpkin dots outfit and here it is! 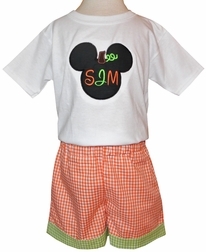 We introduce our monogrammed Mickey mouse pumpkin Halloween or Thanksgiving shirt and shorts or pants outfit. 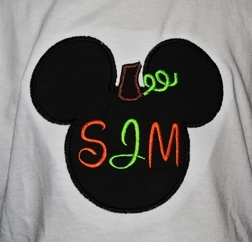 We start with a white shirt and applique it with Mickey Mouse as a pumpkin and monogram your little boy's initials OR name in alternating orange and lime green colors. 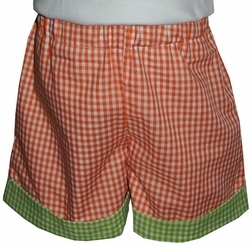 The shirt is paired with orange gingham shorts OR pants embellished with lime green gingham cuffs. You can also just purchase the shirt.